The 10 Best Italian Restaurants in Arizona! Little Italy. Chicago. Scottsdale. What do all these places have in common? Great Italian food. While Arizona has a reputation for dishing out great Mexican and Southwestern dishes, it’s oft left out of discussions about great Italian food. But there is plenty of excellent Italian cuisine to be had in the Grand Canyon State. Here are some of the best local places to chow down Italian style. Tomaso’s has been a landmark restaurant for 40 years. Located along the Camelback Corridor in Phoenix, Tomaso’s has thrived by showcasing the culinary skills of Chef Tomaso Maggiore. His upscale Italian menu combines fresh ingredients with innovative recipes – from the gnocchi with meat sauce to the seafood ravioli. Tomaso’s also has the ambiance of a classic Italian restaurant. The flowing red wine, comfortable atmosphere, and elegant Italian décor make this a great date spot. Fans of deep-dish pizza rejoiced when news broke that Lou Malnati’s was heading to the Valley. The Chicago based restaurant opened in Phoenix back in May 2016 and has had a packed house ever since. Their secret dough recipe and deep-dish pizzas attract hungry customers from across the state. Lou Malnati’s is like a delicious slice of deep-dish pizza – it’s delicious, full, and leaves you craving more. “Holy Rigatoni!” and “Just restored my faith in humanity via amazing pasta.” Those are just a few of the high praise comments found on Ristorante Guiseppe’s Yelp page. This hole in the wall restaurant in Scottsdale has thrived for over 25 years by dishing out simple, delicious Italian fare. Their signature dish, Pasta Alex, is pasta served in a cardinale pesto combination sauce with roasted garlic and spicy Italian sausage. They also allow customers to bring their own choice of wine to their meal without a corkage fee. Feast away! Two words: Lobster ravioli. Arrivederci’s most famous menu item is served in a cream sauce with generous portions of lobster tail. 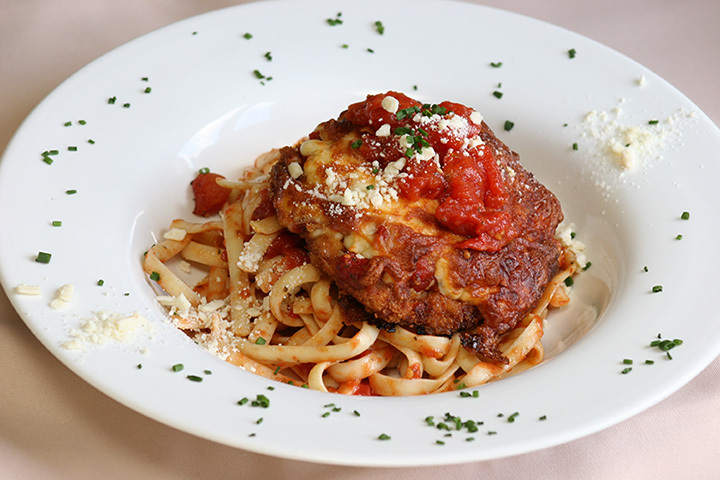 This is just one of the many tantalizing menu items found at Arrivederci. Chef Franco hails from the Amalfi coast and specializes in “Nouvelle Italian” which is a fresh and healthy spin on traditional Italian cuisine. Arrivederci is also budget friendly and has some of the best daily happy hour specials. North Italia is a modern, trendy take on a traditional Italian restaurant. So it should come as no surprise that this is a Fox Restaurant Concept. Indeed, this has many of the attributes of a Fox restaurant like trendy appetizers and unique spins on classic dishes. Their zucca chips are a thinly sliced, deep fried zucchini bits and a bestseller. Their prosciutto pizza blends classic pizza with fig and goat cheese. Of course, it wouldn’t be a Fox restaurant without happy hour deals. Their “Bottle and Board” deal gives customers a chef’s board of charcuterie with a bottle of wine for just $20. Though Mora just had their grand opening they are already making waves in the local community. That’s because Mora is the brainchild of star chef, cookbook author, and “Chopped” judge Scott Conant. Though brandishing a star chef brings lofty expectations, Mora lives up to the challenge. Their menu is simple but brings forth a mix of handmade pastas, shareable plates, and a commitment to bread. Mora’s location is also hard to beat. It’s located along downtown Phoenix’s bustling 7th street restaurant scene. Armed with Chicago roots and epic portions, this restaurant has become a favorite among Italian food fans. Their menu showcases a range of traditional dishes from specialty pastas, steak and veal, and an extensive seafood list. Each location has a vibrant bar and lounge in addition to private dining rooms perfect for special occasions. Times Square brings a taste of New York to the Valley. This restaurant has the feel of an Italian mom-and-pop restaurant found in New York City. It also sheds the notion that a successful Italian restaurant needs to be fancy. Rather, it favors a friendly and casual atmosphere and, most importantly, really tasty dishes. Appetizers like garlic bread and calamari are crowd favorites. Their entrees include a good blend of pizzas and pastas served in hefty portions. All of this adds up to an authentic New York City dining experience crowded with hungry regulars. Spiga is a rustic, modern restaurant with an appreciation for Italian food and wine. Their 2,350-bottle wine cellar features the best of the Mediterranean’s vineyards with wines from all around Italy, Portugal, and Spain. Their expansive patio, bar, and lounge help to create the ambiance of an Italian cucina. Spiga’s menu consists of house-made pastas, wood-baked pizzas, and Sicilian-style seafood. Spiga is the whole package for wine lovers and foodies alike.